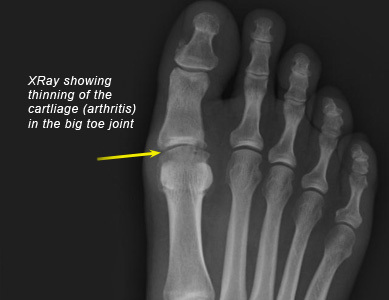 What causes arthritis of the big toe? The big toe is involved in all steps we take. It moves both up (dorsiflexion) and down (plantarflexion). The upwards movement is especially important in toeing off. Greater amounts of movement are required in running, jumping and with some footwear (ie high heels). If upwards movement of the toe becomes painful and limited, it is often due to arthritis (hallux rigidus; ‘big toe stiffness’). 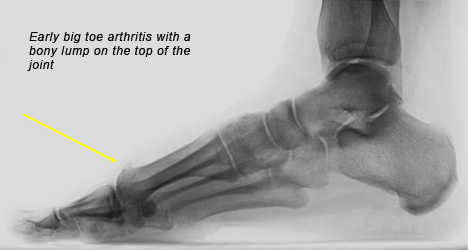 What problems does arthritis of the big toe cause? In the earliest stages of hallux rigidus there is the formation of a bony lump on the top of the joint followed by early wear of the cartilage. This causes a feeling of stiffness in the big toe and a limitation of movement, particularly upwards. This limitation can be very painful and may be associated with swelling. This mostly affects people in sporting activities (from golf to running), stairs and in wearing high heels. In the later stages there is more severe wear of the cartilage. This causes more and more stiffness and pain. Eventually the toe may move very little at the main knuckle joint (1st MTPJ). The pain becomes more severe and comes on with less activity. Eventually the big toe can be painful at rest or even wake you at night. Hallux rigidus can be treated without an operation. This involves painkillers, anti-inflammatories and very occasionally steroid injections. Orthotics may be of benefit. This involves putting a rocker sole on shoes or trainers (some of which are commercially available on the high street). A stiff insole may also help in shock absorption. If this is not acceptable to the patient or has been unsuccessful, then surgery can be considered. In the earliest stages this involves taking off the bony spurs from around the joint (chielectomy). This can sometimes be done through key–hole surgery to minimise the small scar on the top of the foot. 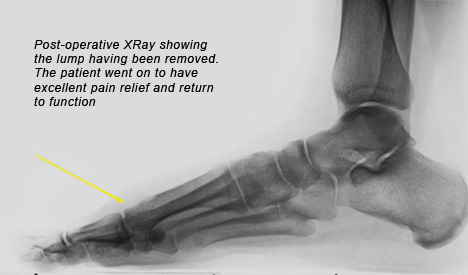 Sometimes an osteotomy of the metatarsal (cutting the bone to very slightly alter the shape on X-Rays) may be included to try and help prevent the condition returning. If the cartilage in worn in a small areas then microfracture (small perforations made in the worn surface) can be used to try and grow back some scar cartilage to improve how the joint works. In the later stages it may still be possible to perform these joint saving operations and this will be discussed with you at your consultation. However, sometimes the joint is too worn to be saved. In these cases a fusion is performed. This is where the 1st MTPJ is formally fused. This is done in such a position that is highly functional. Patients will not normally have a limp and can often return to low impact sports. Although the joint is now stiffer the operation normally has excellent improvement in pain relief. 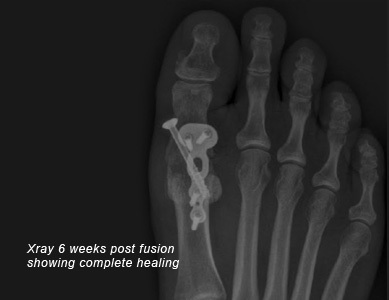 Modern half joint replacements of the big toe can be performed and have early promising results. There are certain cases where these may be considered.